Haters gonna hate, but the Surface Pro 3 has earned its place on this list. Microsoft has quietly added a new Surface Pro 3 to its retail lineup that's tailor made for people who want a little extra power at a middle-of-the-road price point. The new Surface Pro 3 has a 1.7GHz Intel Core i7 processor, 8GB of RAM and 128GB of storage, and costs US$1,299. That's the same price Microsoft charges for an existing model with a 1.9GHz dual-core i5 chip, 8GB of RAM and 256GB of storage. Previously, the i7 only appeared in the two most expensive Surface Pro 3 models, which Microsoft is still selling. People who want more storage will have to pay $1,549 for a tablet with 256GB of storage, or $1,749 for one with 512GB of storage. That new tablet seems targeted at users who don't mind trading file storage capacity for the added power of an i7, which runs at a slower frequency than the i5 but can "Turbo Boost" to 3.3GHz, compared to the i5's 2.9GHz boost. The i7 also features Intel's HD 5000 integrated graphics processor, which provides better graphics than the HD 4400 built into the i5. Still, people who buy the more powerful tablet may not see all the performance they're expecting, since the Surface Pro 3 throttles its CPU if the tablet gets too hot. Under sustained heavy load, the Surface Pro 3 (like its predecessors) dials back the processor performance, which compromises its use as a high-performance laptop. The new tablet comes at a time of opportunity for the Surface Pro line. Windows 10's launch is right around the corner, and one of the marquee features of Microsoft's new operating system is the ability to switch between a desktop and tablet mode for convertible devices like the Surface Pro. That may drive increased sales of Microsoft's professional-grade tablet. It also raises some questions about the future of the Surface Pro line. 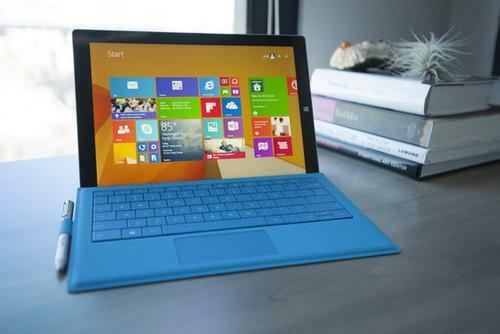 Microsoft unveiled the Surface Pro 3 over a year ago and has yet to announce plans for its next big update.